You are here: Home / Latest Posts / No Poaching Allowed! Jefferson County Commissioner Steve Ammons, (speaking) who worked with the committee to draft the agreement, praised mayors for their leadership and vision for the future. Photo courtesy Direct Communications. 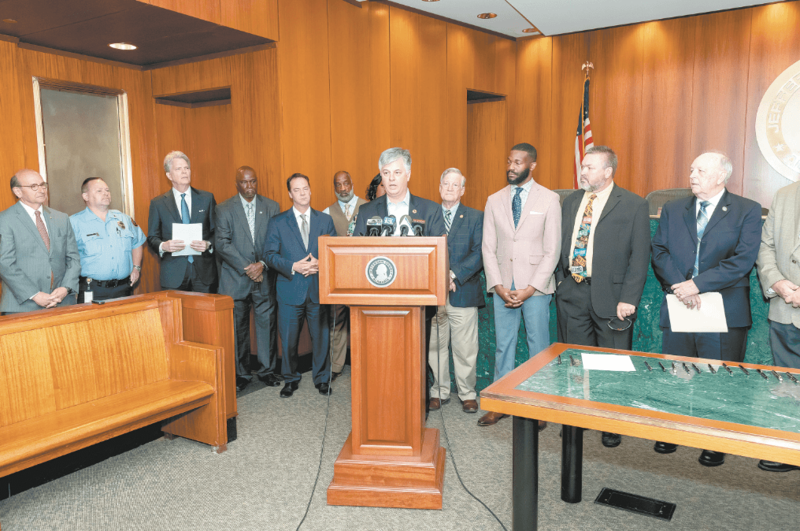 Twenty-two Jefferson County mayors signed a pledge this month to work together to foster economic development rather than competing against each other for businesses. Mayors for Homewood, Hoover, Vestavia Hills and Mountain Brook joined 18 other mayors in the new pact to stop poaching businesses from each other and, instead, put their efforts toward pursuing long-term economic growth for the region. Under the “Good Neighbor Pledge,” cities agree that they will not lure businesses away from other cities in Jefferson County or provide incentives for businesses to move from one city to another. The agreement is a result of conversations that occurred over the past year among members of the Jefferson County Mayors Association. The conversations were facilitated by the Community Foundation of Greater Birmingham as part of its effort to foster more regional cooperation and job growth in Jefferson County. In addition to the Over the Mountain cities, other mayors who signed the pledge represent the cities of Argo, Bessemer, Birmingham, Brighton, Center Point, Clay, Fairfield, Graysville, Lipscomb, Midfield, Mulga, Pleasant Grove, Sylvan Springs, Tarrant, Trafford, Trussville, Warrior and West Jefferson. All Jefferson County mayors have been invited to sign the pledge.